Note that most of these are out of print, but can be obtain from places like http://www.bookfinder.com. One might also explore the possibility of an inter-library loan. The list is organized alphabetically by the author's (or authors') last name where possible. Carter J. L. ed., McGraw-Hill, 1957. A bit dated, but still contains hard data on orbital optimization, atomic spacecraft propulsion, life support considerations, and more. Textbook quality book. Clarke, Sir Arthur C., L. Harper & Brothers, Publishers 1951. This covers most of the issues of space flight, easy to read, but with many of the vital equations listed in the back. Corliss, William R, McGraw Hill, 1960. A little dated, but it has tons and tons of useful equations. It does cover most propulsion systems, and has some data on spacecraft power systems. Textbook quality book. Dyson, George, Henry Hoult and Company, 2002. An in-depth look at the history of old Boom-boom, the nuclear bomb powered rocket. It has interesting details as to performance, and diagrams which are useful for other spacecraft designs. Hagerty, Jack & Rogers, Jon C., ARA Press, 2001, ISBN 0-9707604-0-X. The first part has an entertaining survey of spacecraft from the fictional Tom Corbett TV series to actual early NASA designs, along with incredibly precise blue-prints. But the technical appendix on Atomic Powered spacecraft is worth the price of the book all by itself. The appendix gives the essential propulsion equations, and does a survey of propulsion systems available and on the drawing boards, with hard figures. The end of the appendix contains an extensive table of deltaV requirements for all mission types for the planets and major moons of the solar system. Textbook quality book. Hagerty, Jack & Rogers, Jon C., Apogee Books, 2008, ISBN 978-1894959-70-4. This is a companion volume for Spaceship Handbook, covering flying saucers from movies and TV. It also contains incredibly precise blue-prints, plus engineer notes on discrepancies between the ship exteriors and the interior sets. The sociological impact of the various movies is discussed, along with speculations on possible scientific principles involved. Textbook quality book. Hale, Francis, Pearson Education, 1998, ISBN 0134819128 This is a massive textbook, about one notch below the SMAD. Only $90 instead of $200, it can be found used for about $60. I have been told that it is far easier to read than Fundamentals of Astrodynamics and that it covers gravitational assist trajectories that Astrodynamics does not. However, Astrodynamics is only $16. BEAM WEAPONS The Next Arms Race. Hecht, Jeff, iUniverse Incorporated, 2000, ISBN 0595094503 A good overview of the state of the (unclassified) art in the field of laser and particle beam weapons in 1984. Lots of photos and diagrams, and even a few equations. There is also some interesting histories of various US Defense Department projects. Humble, Ronald W., Henry, Gary N., Larson, Wiley J. , McGraw Hill, 1995, ISBN 0-07-031320-2. This book has it all. Extensive up to date information of chemical, nuclear, and electric propulsion systems, with details and equations to do system analysis and optimization. If you can only get one book, you won't go far wrong if you get this one. Textbook quality book. Lienhard, John H. A textbook on thermodynamics for engineers, may be downloaded for free. Mallove,Eugene, & Gregory Matloff, Wiley & Sons, Incorporated, John, 1989, ISBN: 0471619124. The focus here is on interstellar instead of interplanetary propulsion, but it still has important hard data and the obligatory vital equations. Miller, Ron, Krieger Publishing Company, 1992, ISBN: 0894640399. This is the most comprehensive history of spacecraft design concepts published to date. Tons of illustrations. Pricy, though. Pahl, David, Bison Books Corp, 1987, ISBN 0-671-08925-0. Contains information about space weapons in general and the Strategic Defense Initiative in specific. Pickover, Clifford, Basic Books, 1999, ISBN 0465073158. Written by an actual live scientist, this book goes into scientific detail about what aliens might be like. Very readable. Pogue, William R., Tor Books, 1991. Details on what it is like to live and work in space. Pournelle, Jerry, ACE, 1980, ISBN:0-441-78585-9. This is a collection of science essays, but it includes very lucid descriptions of the problems of space flight, and has vital equations. LIFE magazine January 17, 1949 The article that provided the look for the space suits and space craft for the Tom Corbett TV series and novels. Savage, Marshall T., Little, Brown, & Co. 1994, ISBN 0-316-77163-5. A tour de force book, it contains important data about life support and space colonization. Schmidt, Stanley, Writer's Digest Books, 1995, ISBN 0-89879-706-3. The focus is on science fiction writer desiring some scientific accuracy in their space aliens. Very readable but loaded with great information. Space Mission Analysis and Design. Wertz, James R. and Larson, Wiley J., Kluwer Academic Publishers 1999, ISBN 0792359011. Known as SMAD in the astronautics trade, this is the book the pros use. The drawback is that the book over $200. The advantage is that if it isn't in this book, it doesn't matter. It really does have it all. Textbook quality book. Brackett, Leigh, 1941. Collected in ADVENTURES IN TOMORROW. Rebels escape from a totalitarian regime into a secret asteroid stronghold, for a desperate bid for freedom. Clarke, Sir Arthur C., Signet New York 1987. Details the building of the first space station and the first expedition to the Moon. Cook, Glen, Popular Library/Questar, 1985, ISBN: 0445200065.Shows life on a military starship. It is sort of like Das Boat in outer space. Correy, Lee (alias of G. Harry Stine), Ace Double D-146, 1955. 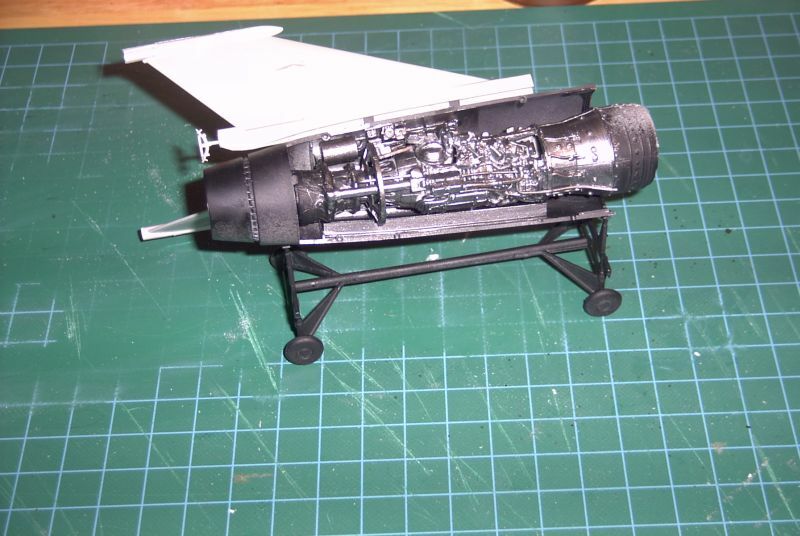 Has fascinating details about refurbishing an obsolete atomic rocket. And what it is like to use it to travel to the Moon, while it gradually falls apart around you. Correy, Lee (alias of G. Harry Stine), 1985. The adventures of the first microgravity space doctor in a project to build the first orbital solar power satellite. Contains a good description of what it is like to wait out a solar storm in a station's radiation storm cellar. del Rey, Lester, 1939, Collected in EARLY DEL REY. A short story about a rocket race. Inspiration for the Meteoris. del Rey, Lester, 1942, Collected in EARLY DEL REY. A short story about the second landing on the Moon with an atomic rocket. del Rey, Lester, Ballantine 1961. A boy washed out from the Space Academy is assigned to fly an emergency mission to the Moon. del Rey, Lester, Ballantine 1952. An extended novel about a rocket race. Godwin, Tom, 1954. Collected in THE SCIENCE FICTION HALL OF FAME, VOLUME I. This story caused an uproar when it first came out. As Dr. Feynman observed about the Challenger disaster, "Nature cannot be fooled." If the equations say that your spacecraft does not have enough fuel, they don't mean "maybe." Heinlein, Robert, Ballantine, 1950. The adventures of a young immigrant to a terraformed Ganymede. The shipboard sequences are of interest. Heinlein, Robert, Ace 1958. The novel goes into some details about the equipment and features of a standard space suit. Heinlein, Robert, 1939. Collected in THE GREAT SF STORIES 1 and THE PAST THROUGH TOMORROW. Good info on shipboard life and working in free fall. Heinlein, Robert, 1948, Collected in THE GREEN HILLS OF EARTH and THE PAST THROUGH TOMORROW. Describes the trials and tribulations of a spaceman on the outside of a rotating spacecraft. Heinlein, Robert, 1963. Has a good description of what it is like to wait out a solar storm in the radiation storm cellar of a passenger liner spacecraft. Heinlein, Robert, Ballantine, 1977. A junior rocket club builds the first moon rocket with help from an atomic scientist. Please, give it a chance, it is much better than it sounds. Heinlein, Robert, 1953, Collected in THE MENACE FROM EARTH. A story about an emergency run to Pluto. Nine days at three point five Gees. Ouch. Heinlein, Robert, Ace 1948. Details the training of a cadet in the Space Navy, the technical details are accurate, as are most Heinlein novels. Heinlein, Robert, 1947, Collected in THE GREEN HILLS OF EARTH and THE PAST THROUGH TOMORROW. An account of the daily life of a rocket pilot. Heinlein, Robert, 1947, Collected in THE GREEN HILLS OF EARTH and THE PAST THROUGH TOMORROW. Contains fascinating details about working in the engine room of an atomic rocket. Heinlein, Robert, Ace 1952. A brilliant but eccentric family seeks their fortune among the rock rats in the Asteroid belt. Has tons of detail about atomic rockets: propulsion, life support, navigation, and more. Be sure to check out Steven Ouellette's marvelous Orbiter add-on that emulates the Rolling Stone. Jameson, Malcolm, The World Publishing Company, 1951. The adventures of John Bullard as he rises through the ranks of the Space Patrol. Lineberger, Matthew , 2006. A hard science fiction story that was inspired by the Atomic Rocket website. The creation of good stuff like this is why I made this site in the first place. Check it out! Meyer, J. A., Astounding magazine, June 1951. An asteroid war short story. The background was borrowed by Alan E. Nourse for his Raiders From the Rings. Norton, Andre, Fawcett Crest 1953. Also collected in the omnibus volume Star Soldiers. Adventures of the Patrol during the decline and fall of the Galactic Empire. This book should be made into a movie. The ending is haunting yet uplifting. Norton, Andre, Ace 1963. Fleeing persecution from a fundamentalist Luddite regime, practioners of the outlawed art called "Science" attempt to build a spaceship to escape to the stars. Nourse, Alan E., Pyramid Books 1963. An asteroid war novel. Interesting background, and a strong "sense of wonder." Pournelle, Jerry, Ace, 1978. A semi-sequel to High Justice. An outcast from a decadent Earth finds opportunity in the asteroid colonies. Pournelle, Jerry, Pocket Books, 1977. The story of a visionary corporation attempting to expand into space despite sabotage from decadent governments. Includes the story "Tinker", with a cameo appearance by the Pilgrim Observer in the role of the Boostship Agamemnon. Rockwell, Cary, Grosset & Dunlap. Smith, E.E. "Doc", Pyramid Books 1937. The first book in the classic "Lensman" series. If you haven't read them yet, you owe it to yourself to get copies. The writing might be stilted, but whenever you encounter a fascinating gadget in science fiction, nine times out of ten Doc Smith invented it back in the 1930's. This includes tractor beams, FTL travel, force fields, and virtual reality. Tedford, William, Leisure Books, 1981.Exciting space combat, but with plenty of hard science. All of Tedford's four novels are worth reading. Vinge, Joan. Collected in Heaven Chronicles, Warner Books, 1991. Arguably the best asteroid civilization novel ever written. White, James, Ballantine, 1972. A facinating story of a nuclear thermal rocket undergoing a disaster large enough to force evacuation in lifeboats. Lots of interesting technical details. Whited, Garon, Xlibris, 2007. A scientifically accurate saga of the crew of a lunar colony after all human beings on Terra are exterminated by a global thermonuclear war. Contains many details of interest to budding young spacecraft designers. Recommended. Williamson, Jack, Pyramid, 1951. Also collected in the omnibus volume Three From the Legion. The stirring saga of the noble heroes of the Legion of Space. A boardgame is a game played with a paper map and cardboard playing pieces. A Role Playing Game (RPG) is a printed book containing the game rules. A Computer Game is (like you'd expect) a game played on a personal computer. (Boardgame) Burnside, Ken; Ad Astra Games 2002 Get this game. Play a few games and you have first hand knowledge of deep space maneuvers and combat. In three dimensions, no less. The clever play aids do all the scary math for you, and keep track of the three dimensional firing arcs. Unbelievably the game is relatively simple to play. The movement is based on Newtonian physics, and both propulsion system plus weapon systems are scientifically accurate. (RPG) Zeigler, Jon F. and Cambias, James L. ; Steve Jackson Games, Incorporated, 2006, ISBN 1-55634-245-4. Contains valuable information for anybody designing a scienc fiction universe. Astronomy, rocketry, biology, technology, there is a lot of meat here. This is a great book to quickly get an author up to speed on the science behind science fiction. (RPG) Bont, Thomas L., Prior, Robert, Thrash, Christopher; Steve Jackson Games, Incorporated, 2003, ISBN: 1556344759. Yes, this is a supplement for a role-playing game, but it has enough scientific meat to be worth looking over. (Computer game: Windows) Particle Systems 1998 Out of print. This game really gives you an education in both Newtonian physics and thinking in three dimensions. The Heads-Up display is quite functional, and will spark your own ideas. Science-fantasy would have you believe that spacecraft maneuver like World War II fighter planes. Independence War pounds reality into your head: spacecraft maneuver like an overloaded 18-wheeler on a road covered in black ice. (Computer game: Windows) Particle Systems 2002 A sequel to Independence War, with more features and a less scripted plot-line. (Computer game: Windows) Windows software that accurately simulates spacefight through the solar system. There is a thriving community who are producing plug-ins and add-ons for Orbiter. Steven Ouellette has created an add-on that duplicates the Rolling Stone from the Heinlein novel of the same name. (Boardgame) Eklund, Philip M.; Sierra Madre Games Co. 1995 Out of print. This game simulates the commercial developement of the Solar system. The list of propulsion systems is quite accurate. Most interestingly is how the map is gridded in deltaV increments instead of distance. The game is worth finding for the propulsion system list alone, the economic development model is also valuable. The game is out of print, but the designer has made an updated version called High Frontier. (RPG) Boulle, Philippe; Dream Pod 9 1992, ISBN 1-896776-45-0. A refererence book that contains stunningly scientifically accurate spacecraft designs. (RPG) Atkinson, Toren and Banks, Warren; Green Ronin Publishing 2002, ISBN 0971438099. A fabulous role-playing game based on the 1970s German TV series of the same name. This really captures the flavor of the 1950's rocket TV shows, with pulpy aliens and all. The designer admits to consulting with an astronautical engineer for help with the technical aspects. And one of their players used information from the Atomic Rocket website to calculate rocket performance for their campaign. (Boardgame) Jackson, Steve; Steve Jackson Games (1991) Out of print. This game is based on the Triplanetary system, and includes an innovative rule for "tractor beams". (RPG) Cambias, James L.; Hero Games, Incorporated, ISBN 1-58366-007-0. Another valuable sourcebook for anybody designing a science fiction universe. From stellar dynamics to types of interstellar governments, this book belongs on the shelf of serious SF authors. This is also a great book to quickly get an author up to speed on the science behind science fiction. (Boardgame) Harshman, John and Miller, Marc W.; GDW (Game Designers Workshop) 1973 Out of print. Playing this game will really give one an intuitive feel for Newtonian physics. The game is long out of print, but one can find the map and rulebook here and images of the counter here. (Boardgame) Oines, Charles ; Irrational Designs 2006 Much like Triplanetary, playing this game will really give one an intuitive feel for Newtonian physics. The difference is that Voidstriker is still in print, and much more fun to play. It includes rules for reaction mass and an innovative action point system. Do check out the forum. Blueprints for the German WWII V2 rocket. 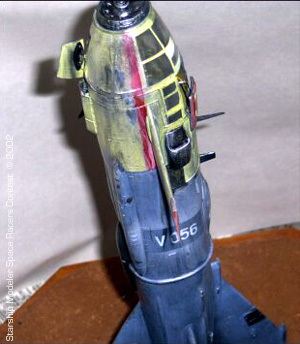 The outline of most space opera rockets in the 1950's is based on the V2. This is a PDF file containing technical information about designing spacecraft in general and fusion propulsion spacecraft in particular. The list of references is valuable as well. Archive of science fact columns by physicist John Cramer. A list of valuable extracts on the topic of advanced propulsion systems. From the Romance to Reality website. Ken Burnside's paper and cardboard wargame with real 3-D vector movement, nuclear powered space warships, and all the scientific accuracy you can handle. Play this one and you'll get a real feel for the problems of interplanetary combat. An excellent overview by NASA's Jet Propulsion Laboratory. This is the blog of an artist and role-playing-game designer who has applied hard science to his works (He also admires this website, which makes me which is one of the things that makes it all worthwhile). He also has a line of spacecraft deckplans for RPGs which are well worth the price. Do check them out. Deep technical articles analyzing various aspects of the Traveller RPG. This site is full of images from the covers of SF pulp magazines and early 1950's SF novels. Site is in French, but it is fairly obvious how to navigate. Contains a small but growing collection of engineering resources for people interested in BOTE science fiction engineering. CG images of exceedingly realisic and scientifically accurate spacecraft. All the more amazing is that he does his work with Bryce instead of more sophisticated software. He is the master of the boolean operator. 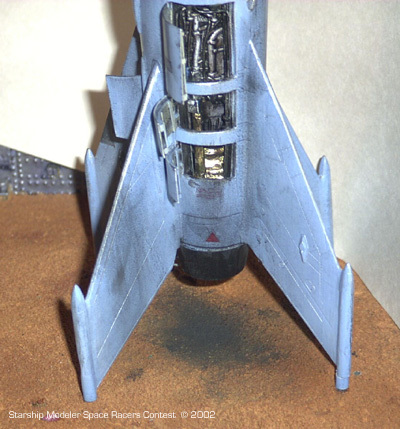 Online catalog where one can purchase paper model kits for Tom Corbett's Polaris, von Braun Saturn Shuttle, 1936 Flash Gordon ship, a ray gun, and more. Secrets of the Cold War in Space: 1959-1969. A fascinating "what-if" future of space exploration with professional quality computer graphics. 1984 report on orbital laser and particle beam defense. Lots of hard information. A study of EMP and fallout damage caused by an Orion drive spacecraft. Includes a simulation program and some Orion diagrams. This huge site is the best reference source of historical spacecraft, bar none. A valuable reference for all questions on the science of space. The site is in Italian, but it has a link to a Babelfish translation. It has lots of images from Chesley Bonestell, Robert McCall, and Frank R. Paul. If you are using Adobe Photoshop, Paintshop Pro, or other Photoshop plug-in compatible program to make pictures of the Polaris, Flaming Pear has plug-ins that will instantly make stunning star backgrounds (with nebulas), suns, and alien planets that will knock your socks off. Check out this example. These three are bundled for the bargain price of $40. People who play the Traveller role playing game will be interested in the plug-in Flexify. It can take a map in equirectangular format and turn it into a Traveller-style icomap. And it just so happens that the alien planet plug-in can output in equirectangular format. Probably the most comprehensive and accurate map of the galaxy anywhere. Click on "Worksheets" in sidebar. Spreadsheet in Microsoft Excel, Star Office, and Open Office format for designing spacecraft. A nostalgic site devoted to the amazing space technology of old movies and TV shows, when the spaceships were not grace-less Apollo-style barrels, but sleek, needle-nosed and swept-winged silver rocketships. This is a list of certain SF story elements that pop up over and over again. Useful if one is intentionally trying to incorporate old SF troupes into your work. The place to go if you are interested in creating photorealistic images of your atomic rockets on your computer with 3-D rendering software. Great if you are trying to learn, want to show off your work, or are looking for an artist to contract for your project. Be sure to check out Rachel Kronick's rendered starships. Luke Campbell tells you all the technical details of laser weapons. This site is a work in progress but the existing information is solid gold. Implemented Equations from So You Wanna Build a Rocket? Eric Rozier has created on-line calculators for some of the equations on this website. Mr. Oleastri is a 3D computer artist with, among other things, a nice selection of 1950's vintage space rockets. He also sells 3D meshes of said rockets at reasonable prices. Overview of about every single propulsion system ever proposed. Interesting Russian language blog with vintage illustrations from the science encyclopedias of Kenneth Gatland. 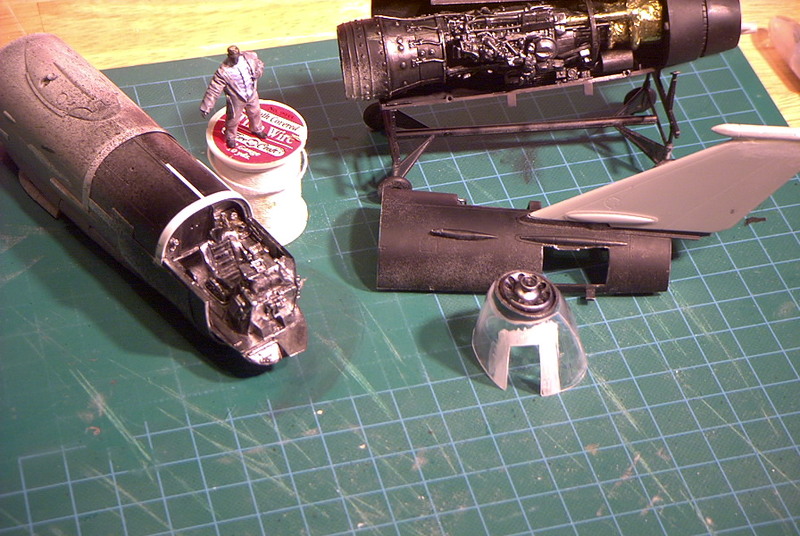 They offer a wide selection of resin and vacuform models of classic SF spaceships from TV and movies. They have a fine section of atomic rockets. Expensive, but worth it. This NASA document is a must-read for all manned spacecraft designers. It covers almost everything, from hatch design to effects of radiation to atmospheric pressure to toilet human factors. Check it out. This great site will quickly get you up to speed on various aspects of interplanetary flight. It will give you enough knowledge to ground you, so you can comprehend more advanced material. 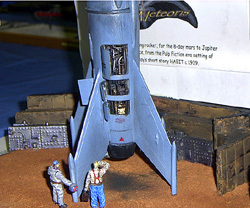 A stunning scratch-built plastic model of an atomic rocket by master model-maker Michael 'Woozle' McGuire. 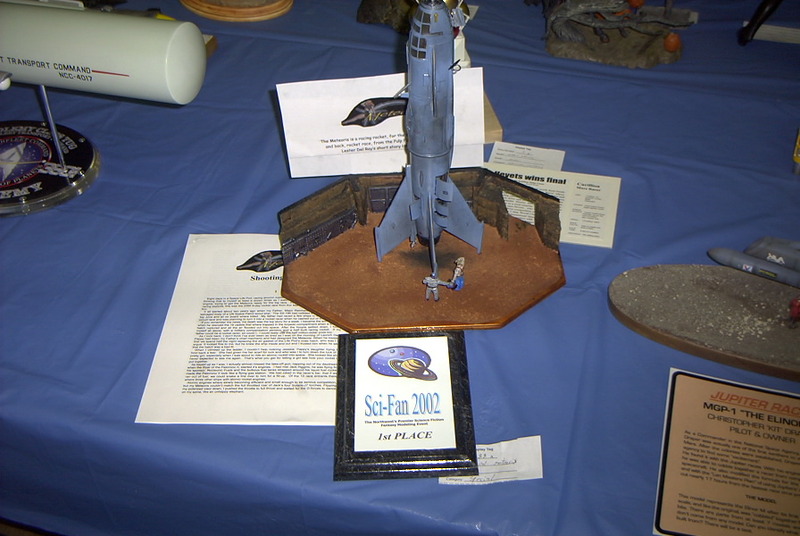 This model was one of the winners in the "Space Racer" contest at Starship Modeler. It was inspired by Lester del Rey's short story "Habit". The Michael is an Orion drive battleship featured in the novel Footfall. Aldo Spadoni, president of Aerospace Imagineering, made a design based on information from the book. The design has been blessed by Niven and Pournelle. (hit the "sort by Topic" button) Advanced space flight technologies. NASA documents on various spacecraft topics. Materials from a University of Wisconsin course on space exploitation. Contains information on orbits, propulsion, economics, and the space environment. The pro-nuclear space movement homesite. A detailed explanation of a hypothetical heavy-lift cargo spacecraft, the "liberty ship". This sucker uses a potent Nuclear Lightbulb style nuclear thermal propulsion unit, and can boost an incredible two million pounds of payload. A huge project to create a hard-science fictional history of the next ten thousand years. How to calculate the optimum exhaust velocity for a given mission. A shameless plug for my Cafe Press store where you can purchase my starship related art. Lucid description on how to calculate engine performance. This newsgroup is for putting hard science into science fiction. Posting a technical question there will generally produce plenty of answers. Much of this website has been cribbed from rec.arts.sf.written. 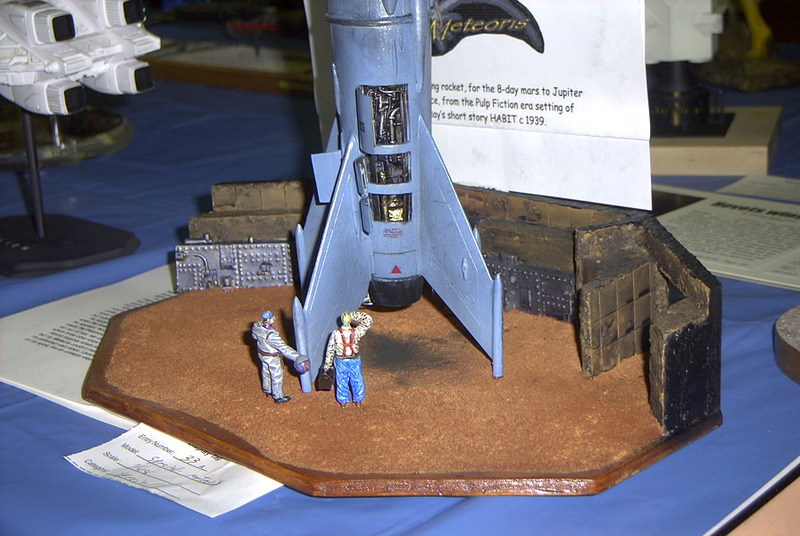 The site is devoted to 1950's style spacecraft and alternate future histories. An on-line concordance devoted to the "Commodore Grimes" novels of A. Bertram Chandler. Of special interest is the entry on Ship Details, with notes on the interior details of various starships. Documents the Tom Corbett TV show, and other 1950's vintage outer space programs. A fascinating fictionalized account of a privately developed surface to orbit spacecraft. It includes lots of hard science and equations. 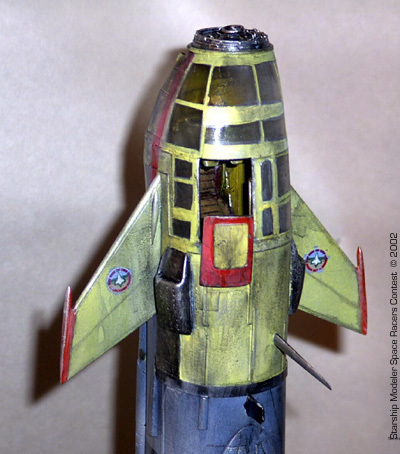 Rick Robinson has a blog that is trying to revive the old Heinlein-esque atomic rocket style science fiction. He calls it "Rocket-punk." Check it out and contribute to the conversation. 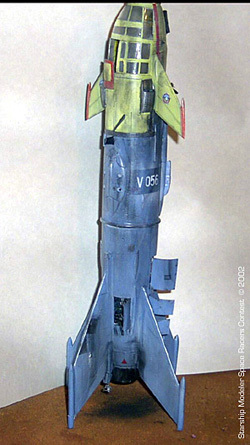 Free paper model kit of the rocket from the movie with the same name. The amazing website of Jon Rogers, spaceship archeologist. A new and growing site, it will eventually be the definitive website for famous spacecraft of movies and TV. Keep an eye on this site. Mr. Lowther is working on a book entitled "Spaceship Design", which will render this website obsolete. This is due to the fact that Scott is a real rocket scientist, and I am not. Mr. Lowther has also done some science fiction technical consulting. This Yahoo discussion group is devoted to science fiction conflict simulation game development. There is lots of hard science, and interesting notes on spacecraft combat. 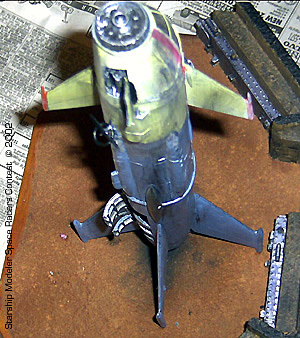 Much of this website is cribbed from SFConSim-l.
Discusses the challenges of designing a rocket with space-opera performance. Contains many images of rocketship concepts of yore. Nothing like details from a real spacecraft as a reality check. Interesting vintage artist conceptions of what might have been assembled by Marcus Lindroos. 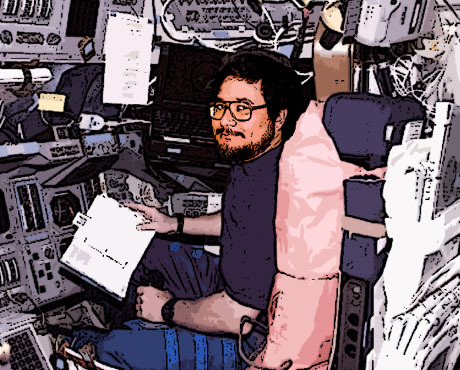 An archive of useful Usenet threads on various space travel topics. RAND analysis of various space based weapons. A fabulous website surveying visions of the future as seen in 1950's era science fiction. Contains loads of vintage retro illustrations. A dictionary of science fiction topics. Pithy, hysterical, but very accurate. An encyclopedia of common tropes in science fiction on TV. Spot-on, accurate, exceedingly funny. You should read this so as to avoid the tired old standard misconceptions. Scroll down and click on the V-2 Rocket link. Most of the "special effects" footage of rocket liftoff in the Tom Corbett TV show was actually films of WWII German V-2 rockets. 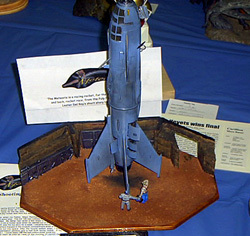 This exquisite paper model from Currell Graphics reproduces the rocket in 1/32nd scale, about 17 inches tall. Download the files, print them out, and assemble. 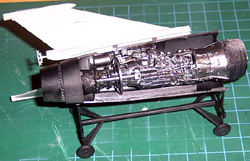 Creative readers can alter this kit to create a scale model of a Space Patrol cruiser, perhaps even with cut-away sections revealing the various decks. 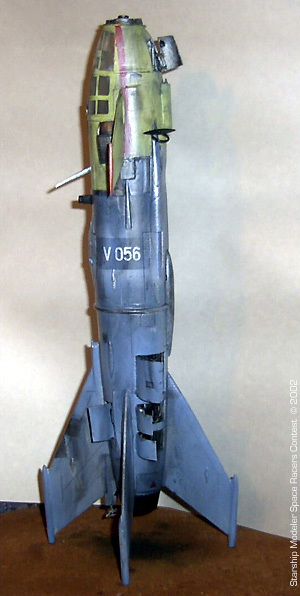 List of various plastic models of the V-2 rocket, current and no longer available. A great site with scans of the cover art of the classic Winston Science Fiction novels. Lots of rockets and spacemen. Steve Colgan's blog is the ultimate alien and exobiology website.